Princess Margaret visited a St Johns Ambulance Cadets rally in Doncaster. She was met here by the Duke of Portland and Lady Edwina Mountbatten. Princess Mary (daughter of King George V and Queen Mary) and Lord Lascelles attended The Hackney Horse Show, and Her Royal Highness presented the prizes. Princess Helena Victoria, cousin to King George V, came to Doncaster to open a Fayre and Bazaar, arranged by the Y.M.C.A. to raise �1,000 to help the young of the town. The previous year had been tough with a coal strike and Princess Helena walked the stalls buying items including Doncaster butterscotch. The King and Queen also visited Conisbrough on the 8th July, 1912 arriving by a special train in Doncaster at 4pm, and received at Conisbrough Castle by Mr W. Lowry Cole (agent of the Castle's owner, the Countess of Yarborough), who conducted them around the monument. The Royal Party then left for Wentworth Woodhouse, where they were the guests of Earl and Countess Fitzwilliam, journeying through Hooton Roberts, Kilnhirst and the Haugh. On the following day they visited Clifton Park in Rotherham and Silverwood Colliery. Later, they travelled through Rawmarsh, Swinton, Mexborough and High Melton to the new model village (Woodlands) at Brodsworth. 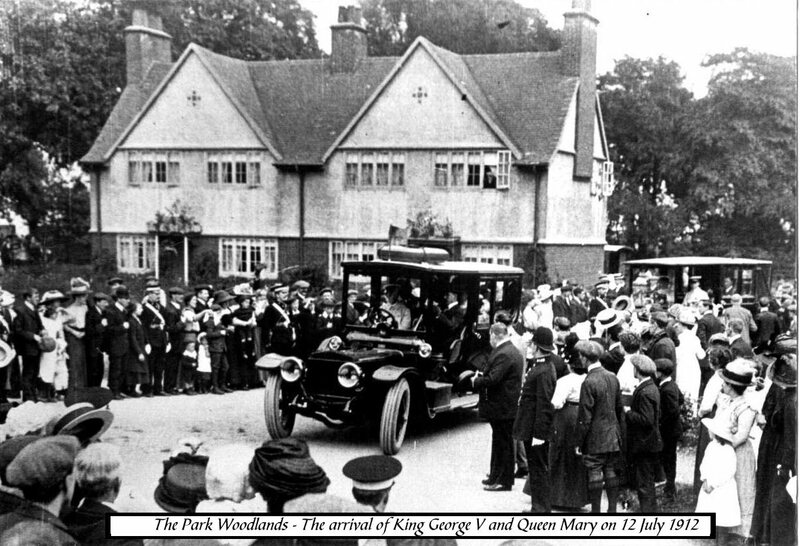 Here's a photo (click for larger version) of King George and Queen Mary arriving in The Park, Woodlands in 1912 to open the Model Village associated with Brodsworth Colliery. The architect for the village was Percy Bond Houfton from Chesterfield who designed cottages for the miners of the neighbouring Brodsworth Colliery. The houses were designed in cottage-style within a semi-rural setting of lawns and trees - the imaginative layout contrasts favourably with the straight terraces of Denaby Main built 25 years earlier. The cost, however, deterred the colliery company from further building of this kind, and at nearby Highfields, its next venture into house-building, the company followed less imaginative plans. Contributor Gary Goodlad relates: "The house on the right hand side is 116 The Park, Woodlands, where I lived from 1944 to 1967 when I married and moved out. My Grandfather Henry Goodlad was the first underground worker to sign on at Brodsworth Colliery and he moved into 116 the Park around Christmas 1907 so the house will be 100 years old this year. Henry is on the photograph standing at the back on the LHS wearing his flat cap. Those hanging out of the windows are members of his family. My father Benjamin Goodlad was born in 1907 and also lived at 116 The Park, Woodlands, until he died in 1977." The couple lunched at Hickleton Hall with Lord Halifax, and returned to Wentworth via Goldthorpe, Bolton and Wath, calling at Lord Fitzwilliam Elsecar Colliery. Then in the afternoon they visited Cadeby Colliery, where two terrible explosions had occurred with great loss of life. The couple were greatly moved by the disaster and shared in the grief shown by the mining communities of Conisbrough and Denaby. HRH Princess Christian opened a 3-day fund-raising bazaar to expand Doncaster Infirmary and Dispensary. She afterwards visited the hospital and agreed to become a patron of the institution. King Edward VII was an avid racehorse owner and visited Doncaster Races for the St Leger in 1903, 1906, 1907 and 1908. He usually travelled by Royal Train and stayed at Rufford House near Ollerton Station (closed in 1955). Victoria arrived from London by train and she was accompanied by husband Albert and three children � the Prince of Wales, the Princess Royal, Prince Alfred, and Princess Alice. The Queen was also pregnant. They stayed at The Angel Inn, and the town run out the bunting and went a bit nuts for a special royal visit.